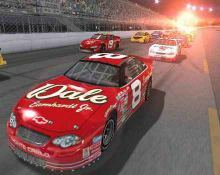 EA’s NASCAR Thunder 2002 is a much-improved version of last year’s NASCAR game. While it hasn’t been designed specifically for the Xbox, the game still offers plenty to recommend it. Featuring improved graphics, a full field of opponents and, most importantly, significantly improved gameplay. This is now a more realistic and accurate simulation of real-world racing. With more than 50 actual NASCAR drivers and their vehicles, all 23 official racing tracks, multiplayer split-screen action, NASCAR Thunder 2002 should fit the bill for Xbox owners looking for an adrenaline rush. Last year’s NASCAR 2001 from EA was a solid game but left many gamers disappointed because while it was a leap forward, it still didn’t go far enough in the simulation department to truly offer a satisfying experience. The blocky textures, jaggies on the PS2 and limited racing field were serious detriments to what could have been an excellent game. With this year’s edition, it’s obvious that EA has listened to the masses and has unleashed a vastly improved version on the Xbox. While it’s obvious that this title wasn’t specifically designed to take full advantage of the console’s graphics abilities, the disappointing visuals don’t hide that there’s still a solid game engine underneath. The biggest change from last year is that NASCAR Thuder 2002 is a much more robust simulation. There are loads of options at the start-up screen and the features included run quite deep. A quick run-down of the major selling points include: a full compliment of 43 cars in each field, more than 50 NASCAR stars including Jeff Gordon, all the NASCAR tracks and real-world cars, to name a few. There are other changes such as more realistic damage modeling and better controls, which we’ll cover later. Several different play modes are available including Quick Race, Career and Race Weekend. Race Weekend allows you to practice, qualify and race the course. Career mode accurately represents a real NASCAR career where you can build up your skills during the course of a complete NASCAR season and then defend your position the next year. Quick Race is just what it sounds like and is for players looking for some fast fun without commitment. With all these modes, the game can seem a bit daunting but this adds plenty of fun to the game. What’s more, NASCAR isn’t a static game and allows the player to set things up to their preference. In addition to choosing which gameplay mode to race in, you can also customize one of the cars to maximize its performance on the track by changing the weight, engine, tires, suspension, transmission, gear ratios and other parts on your vehicle. The interface to do this is simple and intuitive and you can also test out the cars in practice laps to make sure it performs right. You should always do this before you commit to racing because this can play a significant role in how your car performs. This can be tricky and is mostly successful if you know what you’re doing. How you decide to outfit your car is up to you and you can also choose to create a completely new car for yourself in career mode. This you to create a vehicle that suits your driving style. All the standard options are present and this has to be seen as a plus. You can also decide how realistic the damage modeling is, how aggressive opponent drivers are and the number of laps you run. Another feature of NASCAR Thunder 2002 is the ability to customize the weather conditions and can customize the track order in season mode. Your controls are pretty good and you can select to use either the usual analog mode or the d-pad. Which one is better is a matter of personal preference and the main problem here is that while the controls are decent they don’t offer the precision that one would like. Another major problem with the game is that while the damage modeling is realistic, in some modes, you can simply press a button and the damage instantly vanishes. This isn’t really cool and detracts from the experience. On the other hand, the actual gameplay is quite solid and does a good job of accurately reflecting real-world strategies. Rival drivers can be very aggressive and you’ll have to fight their advances all the way to the last lap in order to win a race. What’s more impressive about the AI is that drivers will fight for position even well-back in the pack. As stated before, there is a full count of 43 drivers in each race so gaining that pole position isn’t as easy as one would expect. You’ll definitely need a lot of skill and some aggressiveness yourself in order to win. In addition to the other racers, your biggest obstacle lies in the layout of each course. Each of these is a challenge in and of themselves, contrary to the condescending notions of circular racing. Mastering each can be quite challenging a varied with some built for speed and others with longer laps that have long straights where you need to anticipate the different corners, some of which are quite vicious if you’re not careful. There are even a couple of tracks that aren’t round, which should come as a surprise to some. NASCAR Thunder offers plenty of racing variety in this regard, making the game have quite a lot of replay value. Of course, if racing against the computer isn’t enough of a challenge or the AI racers become too predictable, you can race against 3 other friends via split-screen mode which should add even more intensity to the game. Visually, NASCAR Thunder is decent and does a good job of accurately representing the feel of racing but doesn’t really push the envelope. This is the least impressive part of the game and is probably mostly due to the fact that this is a port from another system as such doesn’t really reflect the abilities of the Xbox. The visuals seem a bit grainy and the detail isn’t that impressive especially when compared to other racers on the console such as Project Gotham Racing. On the other hand, its graphics look significantly better than last year’s model with some new effects, such as lens flare enhancing the engine. The car models are good with a lot of detail and the damage is fairly realistic with smoke and other wreckage spewing out over the courses. During each race, you can also pick from different camera angles with some good camera positioning though the in-car view is still pretty lame. Decent sound effects are highlighted by the communications with your team but the music isn’t that great. Why anyone would pick the lame 1970’s dinosaur rock as the game’s main theme is baffling and the in-game music isn’t much better. Still, the presentation of NASCAR Thunder 2002 is relatively decent overall but the port is disappointing because it fails to take full-advantage of the Xbox. In summary, this is an excellent title that delivers an exceptional recreation of the NASCAR experience. While it would be best to experience it with a driving wheel, none is currently available and the Xbox controller is a fine substitute for now. From a gameplay standpoint, this is a solid release that offers a challenging racing experience with a lot of depth and excitement. This is especially true in the later laps when you get into a dogfight with other racers and have to struggle to keep your position or move up in the pack. It’s here where the game’s excellence shines through and makes for an addictive and challenging racing game. However, the game isn’t perfect by any means. This sounds like a broken record, but the game just isn’t up to the technical standards set by other racers on the console and makes this a disappointing port from that point of view. That said, it still looks decent racing fans shouldn’t hold the lack of polish against NASCAR Thunder 2002 because this EA release excels in the most crucial area of gameplay to deliver an enjoyable, authentic racing simulation.